Hi there, this is Chris! 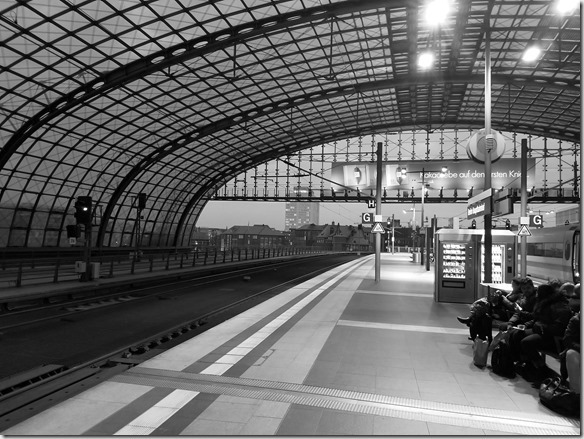 I’m an aspiring YouTuber, software engineer and solution architect living in Cologne, Germany. 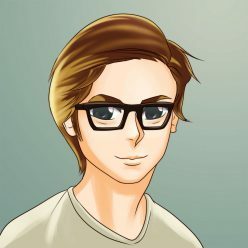 I am a fan of all things related to technology, travel, and movies; I’m also currently pursuing a degree in Computer Science. Even worse: Sold out for Russian gas? 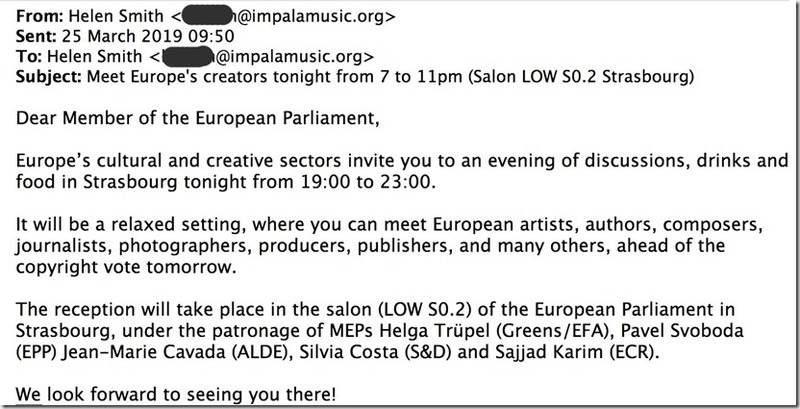 Nothing gets old as fast as news – just as we were looking at Helga Truepel hosting yet another lobby dinner, the FAZ published an article, outlining the background behind the surprise Trilog agreements that made the Copyright Directive so much worse. 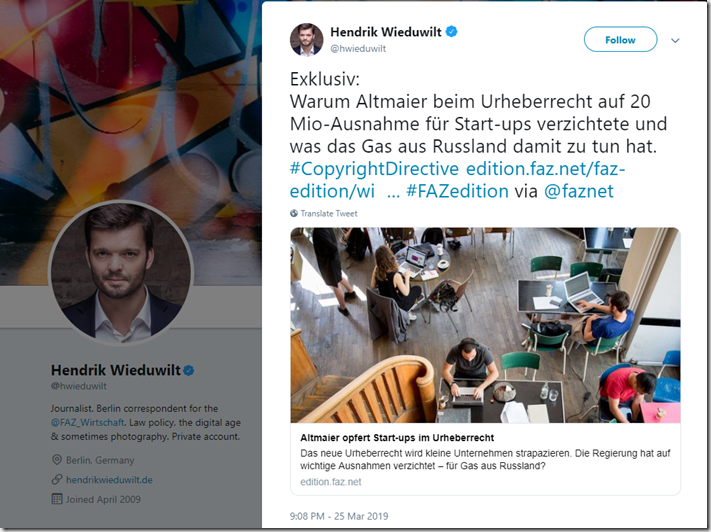 According to this article by Hendrik Wieduwilt, the agreement reached between France and Germany was based on Russian gas; if the allegations hold true, the German government agreed to a much stricter copyright law in return for the French government agreeing to North Stream 2. This is so bad, on so many counts – my feeling is that not even Franz-Josef Strauss would have done something so shady. 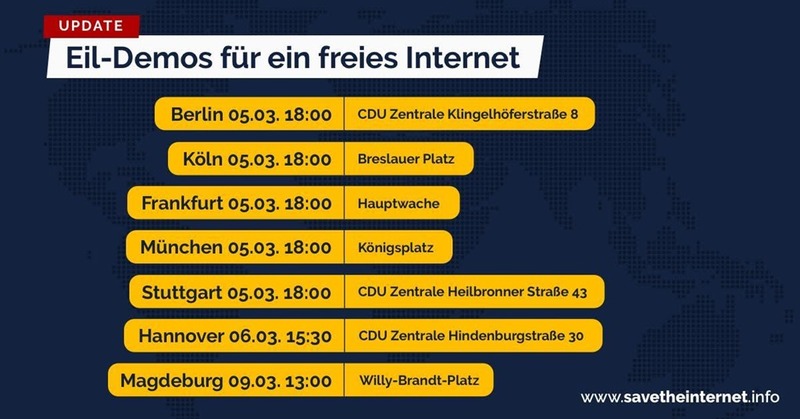 Not to mention that the CDU thus broke the coalition contract they had with the SPD, which explicitly stated that Germany would veto upload filters. 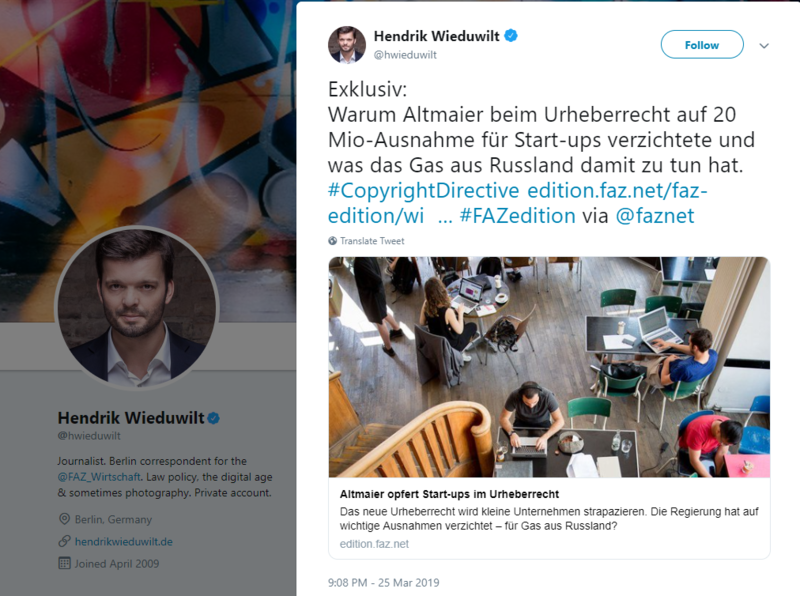 Personally, I am not happy with Germany buying so much gas from the Czar – but I would have never thought that our government would kill Social Media for it. 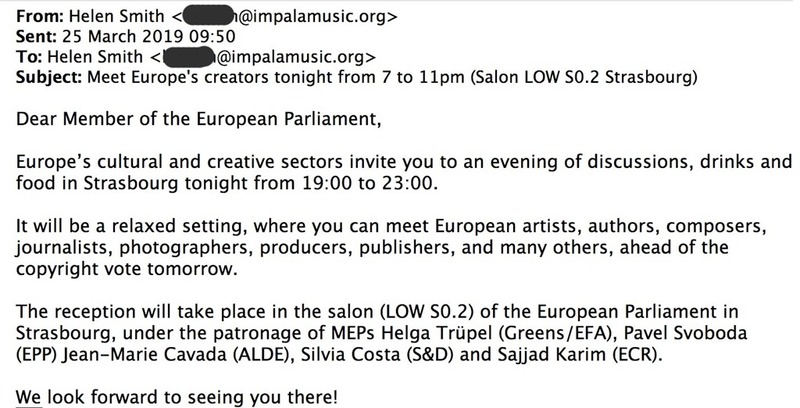 An evening before the vote on the misguided EU Copyright Directive, lobby groups are holding a dinner for MEPs. Impala are still touting the narrative that they are heroically fighting the evil US tech giants. Their tagline is Europe for Creators – Creators that have signed up with a media agency and hand over a substantial part of their income, that is. They completely fail to understand that it is them, the old-school publishers and media agencies that forgot to adapt to the digital age, who are the evil lobby groups in this case – killing social media because they don’t want to adapt their business model and wouldn’t survive otherwise. It’s indeed a struggle between David and Goliath – but with us creators being David, and them media agencies being Goliath. I’m done commenting on the shameful role of the Greens in this, with MEP Helga Truepel actively supporting the directive and fighting against everything the Greens ever stood for, without any opposition from her peers or her party. 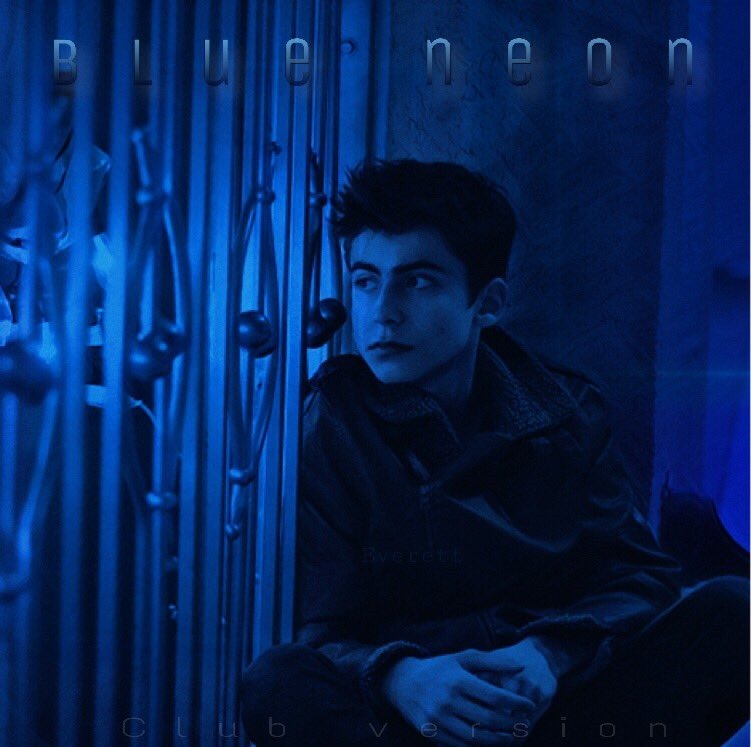 Fantastic new single by Aidan Gallagher, who was nominated UN Environment Goodwill Ambassador for North America and also plays the enigmatic Five in Umbrella Academy. 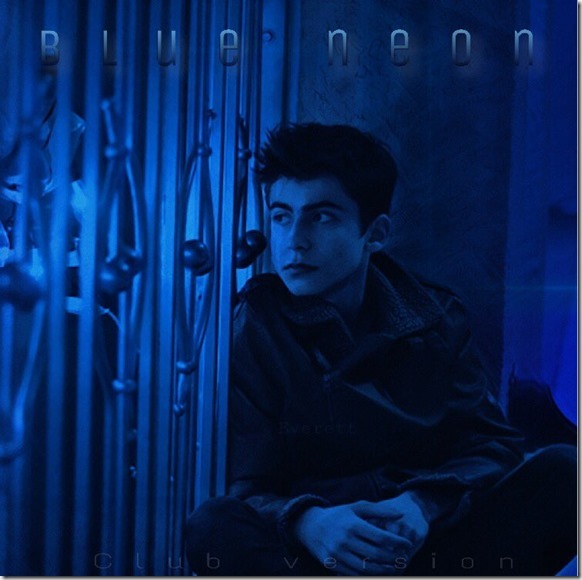 I have it on repeat since its release on March 21 – highly recommended! 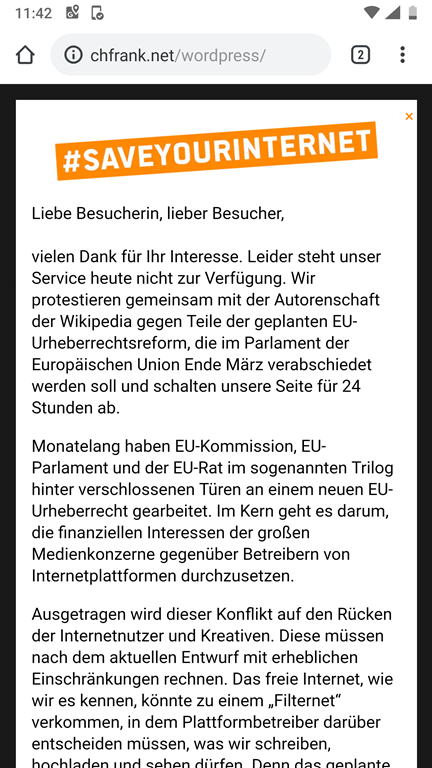 Yesterday, on Thursday, March 21st, Wikipedia and a number of other sites went offline to support the fight against article 13 of the EU Copyright Directive. So did I with this blog. See you tomorrow at the EU-wide rallies against article 13! 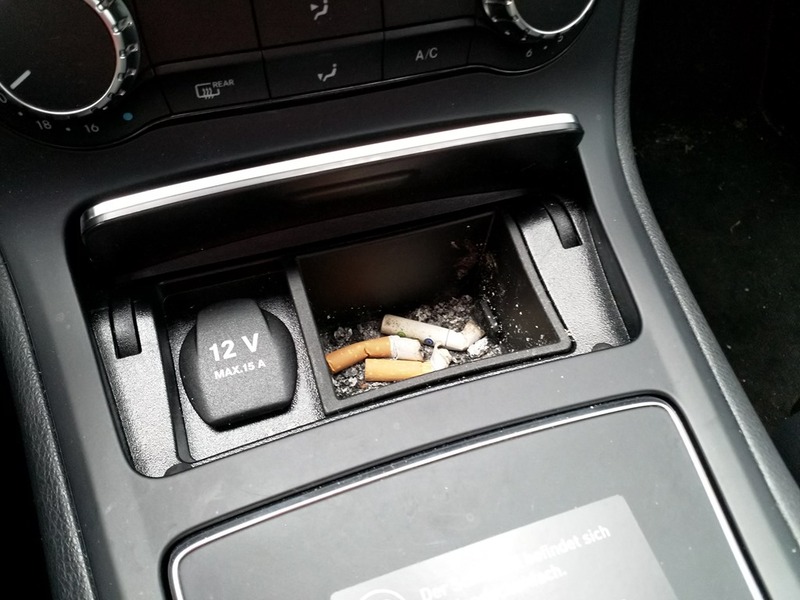 Smoking in a rental car or car sharing is more than just inconsiderate! In the 21st century, smoking in public is no longer a socially accepted behavior, simply because it’s no longer ok to poison others. I do not care what you do in your own home, or your own car – but do not leave your cigarette buds in something shared! A couple of weeks before the official sunset I’ve finally moved back to Gmail on all my devices. I will for sure miss the much more modern interface and the easy grouping of Emails by topic! Also, having a tight integration with Google Trips made my life much easier. Apps come and go – I’ll miss that one, though, at least for a couple of weeks . The more I look into the details of the revised EU Copyright Directive, the clearer it becomes that this directive has been written for the sole purpose of propping up businesses that are not capable to adapt to the digital age. 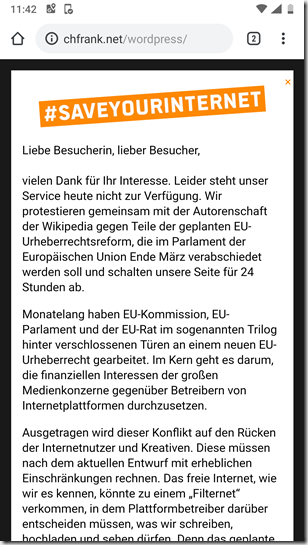 In a new twist, the lobby group for the digital rights management firms here in Germany (GEMA, VG Wort, VG Bild-Kunst, VG Musikedition) sent out a letter, explaining that the primary goal of Article 13 was to collect licensing fees and in that letter positioned themselves as ideally suited to do so on behalf of all users. In other words, the rights management firms have lobbied the EU parliament, under the pretense of protecting artists, for a way to force the platforms to pay them licensing fees for all user-generated content. Unbelievable! They want to get paid for rights to content that they don’t own and have never supported – in the past they had nothing but disdain for us mere creators. And the EPP, some Progressives as well as some Greens support them. 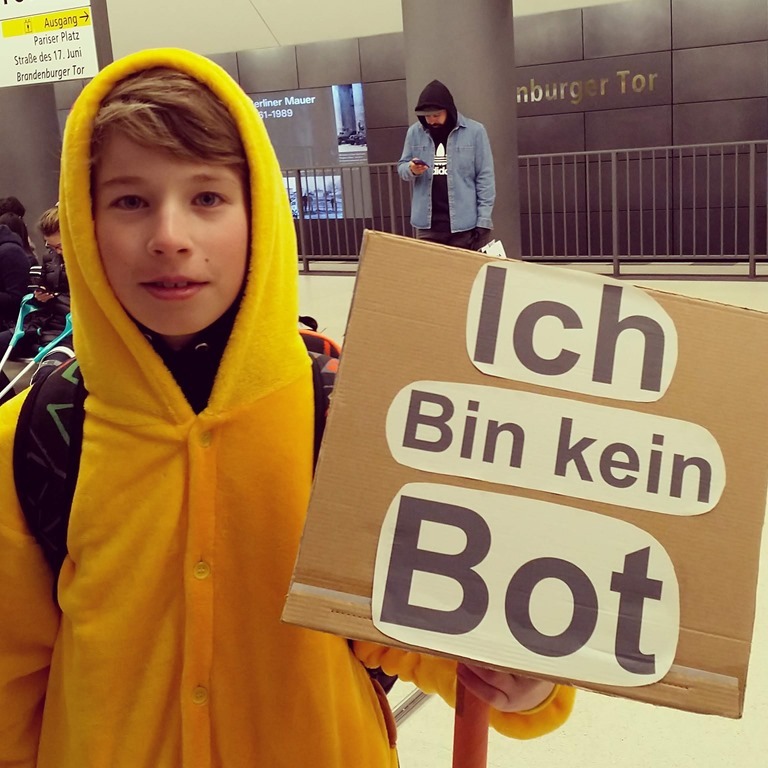 Last Saturday I attended the first rally in Berlin against Article 13 of the revised EU Copyright Directive. 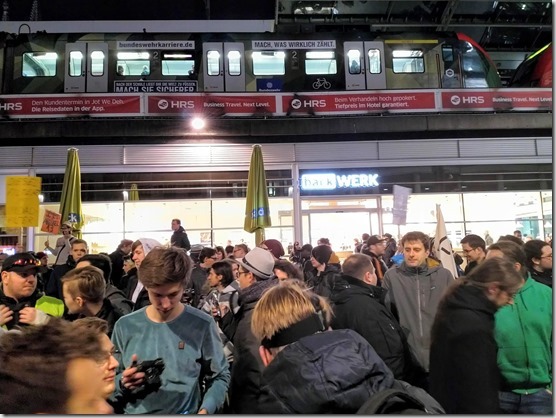 Pretty impressive turnout and a number of prominent artists that were supporting the event – Berlin being Berlin, there was more techno music than chanting, but overall it was a well organized rally and I am glad I went. Monday then saw a move by the EPP to move the date of the parliamentary vote forward a couple of weeks, to avoid the European protests on March 23rd – so we all took to the streets on Tuesday, forcing the EPP to back down, not without them trying some rather dirty maneuvers first, though. 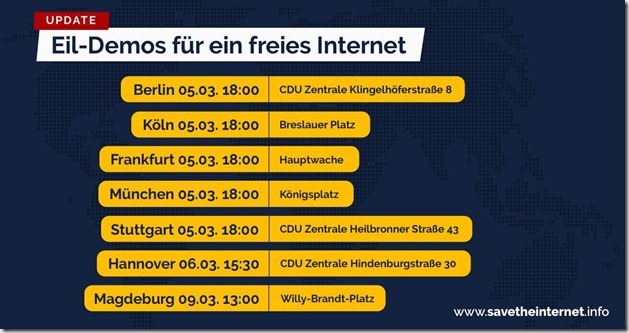 This Saturday we’ll again have rallies, in Germany 9 cities have signed up so far. Think Article 13 will only affect Gen Z and YouTube? 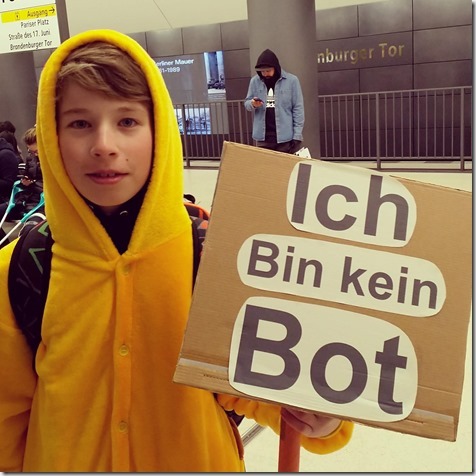 The whole internet generation is up in arms – reason is article #13 of the revised EU Copyright Directive, due for final parliamentary vote late March. In a nutshell, the directive will make all commercial platforms older than 3 years, that have “online content sharing” “liable for unauthorized acts of communication to the public of copyright protected works and other subject matter” (Quotes from https://juliareda.eu/2019/02/eu-copyright-final-text/). This affects only (your) YouTube kids, right? Unfortunately, not. Article 13 is not only about video – images, photos, music and texts are also copyright protected works (including this article, by the way). Under the new regulation, _all_ sharing sites, and that includes professional networks such as LinkedIn or Xing, will become liable for copyright violations of their users and will have to take reasonable measures to prevent such violation to occur (hence the #uploadfilter). Prior to publishing any user-generated content, any provider will have to make sure that the text, image or video does not contain any copyrighted material – if it fails to do that, it will open itself up for litigation (not mentioning the link tax here, for brevity and readability), which will pose a significant financial risk. As an example, let’s look at this text: No platform whatsoever can determine for sure whether I have written this text myself (for the record: I did) or whether I copied it from one or more sources on the internet. The best option to avoid litigation thus is to disable uploads from users, and only buy content from well-known publishers. That’s what everybody is afraid of – the end of user-generated content, the end of Social Media, and the end of professional networking sites. Article 13 will not protect artists, and it will not do anything to help them secure an income from their work. This claim is being perpetuated by a lot of organizations, unfortunately it turns out to be false once you read the actual text of the directive; intention and execution seem to be quite a bit out of sync here. We have only days, or possibly a couple of weeks left before the final vote, and we need to act now! Yesterday, on my way to the article 13 rally in Berlin, someone in deep desperation jumped out in front of our train and killed themself. I hope they will now find the peace they were looking for! My heart goes out to the train driver, who will have to live with this trauma for the rest of their life and I hope they will have the support and strength needed to deal with it! 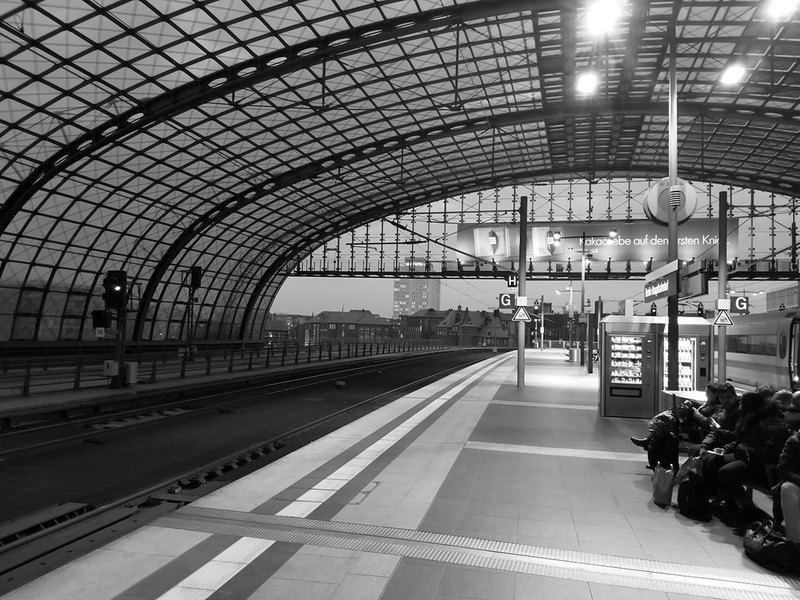 I am also very thankful for the Deutsche Bahn officials involved, who drove the train to the nearest station, saving us from evacuation.